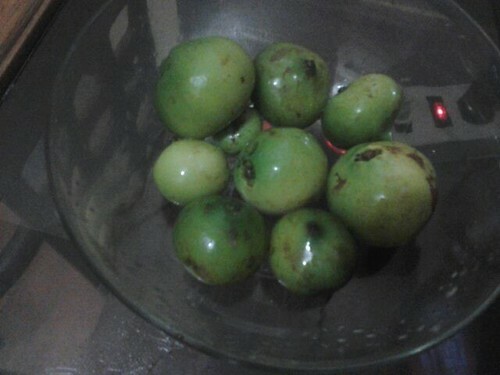 Batwan which is also called Batuan, Batuan or Batuwan or Garcinia Binucao is indigenous to the Philippines and possibly Vietnam, and it is a relative of Mangosteen.Its fruit is somewhat round in shape, around 4 centimeters in diameter, greenish in color which turned yellowish when mature. They have a firm outer covering and contain a very sour pulp and several seeds. It has a sour taste but not acidic to the stomach. The Batwan tree thrives in parts of Bohol and Leyte as well but it isn’t used much in those cuisines. The use of Batwan fruit is one of the distinct features of Ilonggo cuisine, especially for cooking "Sinigang", Philippines sour soup or stew. Ballok (Benguet); Balikot (Ilocos Norte); Bangkok (Zambales); Bilukao (Rizal, Bataan, Batangas, Camarines); Binukao (Laguna, Bataan, Batangas, Camarines); Buragris (Camarines); Kamangsi (Tayabas); Kandis (Palawan); Kamurai; Kulilem (Cagayan); Haras (Capiz) and Maninila (Albay). The use of Batwan is dying out in most part of the Philippines and it might not even known in other parts of the country, except Negros and nearby areas that use it a lot in preparing some of their dishes. Negros Region of the country, particularly Bacolod use Batwan as souring agents in cooking various dishes, such as Paksiw na Isda (fish cooked in vvinegar, Kansi (jackfruit with mung beans and coconut cream), Pinamalhan (a dry style Paksiw na Isda) and Tinolang Isda (fish with sour soup). Batwan is also use in cooking the classic dish named KBL (Kadios, Baboy and Langka) from Iloilo. In Negros, the people basically use Batwan to any dish that requires a souring agent instead of Tamarind (usualy souring agent in Luzon Island). It is said that Batwan only grows in Panay or Negros, other people say that it is also abundant in other parts of the country, but perhaps not used as souring agent. Batwan is a huge tree with lost of fruits when it is in season. and it is the only souring agent that the people knows in Panay and Negros Provinces/Islands. However, It is said to be used also in other Provinces, such as Leyte, Bohol, Masbate. Below is a not so well-photographed picture of Batwan which was luckily shared by a friend from Iloilo to my brother who likes to experiment on other local products to make his Sinigang.